Its make me kind of explode today.. y? coz of there is a person who doesn't know the meaning of tolerate.. here in my office rite now, we are having a problem in getting space for officer to at least and do their job. its make my temperature goes up when there is people that doesn't now how to share.. make this office like his father office!! today.. i've got new staff.. thanx god.. so i ask him to share with other officer back there.. but the old officer doesn't want!! he ask him to find another space.. i dont want to start a war.. coz we are told to be calm.. not to explode .. not to that and this.. hmm.. how can work can be done if we're in like this.. 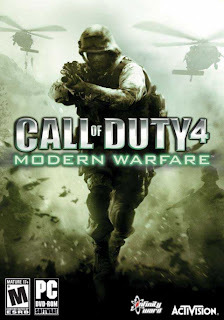 Call of Duty 4!! what can i say bout this game. i've finished playing this game bout a month ago. when playing this game, i know that i'm suffering from motion sickness. yeah.. when playing this game for more than hour, my head start to feel dizzy, my body feel like want to collapse.. this not happen to me when i'm playing GTA:San Andreas before.. dunno becoz my age or becoz of this game. ha.. ha..
a few weeks ago, i was shocked by the fact stated in the newspaper say that by playing this kind of game, u can improve your eyesight efficiency!! dont really know what does it mean.. hehehe... at last!! there is a good fact bout playing game.. haha..
oopss.. bout the game.. back to the topic.. this is a war game.. you will be named as "Soap" Mac Tavish, a young and energetic soldier.. we have to go through mission by mission.. most of the mission we are lead by Sergeant Paul Jackson. The villains of this story are Imran Zakhaev "the leader of Russian Ultranationalist Party" and Khaled Al-Asad "the commander of the revolutionary forces in the middle east".. the last mission is you will killed those two guys.. for futher info, play it by yourself.. hihihi..
hmm.. the moral of the game?? you never want to go through war!! i've been there, been through it.. with the bomb and all sort of explotion.. never ever hope for war.. it's like hell!! even worse maybe?? ho ho ho.. what about that.. now i know why i didn't have new post on my blog.. yeah.. its becoz of this.. yes.. a few months ago i've decided to write this blog in english.. so that it can help me to improve my writing.. actually there are so many thing that i wanna share with u guys.. but then the problem to translate it to english has stop me.. yeah.. my english is even worse than the guy in 'mind your language' series.. oo blind me.. hehehe.. just watching that tv series to watch that girl from france.. huhu.. ok.. by the way.. may be i have encourage myself to write it again eventhough i know my english is as bad as kindergaten kids or maybe even worse.. huhu..